One of the most attractive aspects of artificial grass is the lack of care that is required in comparison to real grass. After all, artificial turf doesn’t need mowing or trimming nor is there any need for fertilizers which saves you both time and money! After heavy rainfall it is not uncommon for natural turf to have pools of water sitting on top of the land. Not only can this cause the yard to become a bog, it looks unsightly and can cause a range of issues in the future. Artificial grass on the other hand comes with a water filtration system that ensure any rainfall drains through and does not sit on top. One issue with real grass is the gamble of whether it will die and turn brown. After all, a dead lawn is not the most eye catching or aesthetically pleasing thing you can own. With artificial grass you can be sure that your yard will remain green and bright all year round without any risk of decaying. Since it has become so popular, many home buyers are now looking to purchase a house that has artificial grass installed so if you ever decide to sell up it is possible than an artificial turf could increase the value of your home quite considerably. Whilst artificial grass has improved in popularity quite considerably there is still a percentage of the population that refuse to acknowledge it’s existence. In fact these people are so blind to the possibilities that they will not even listen to an unbias argument discussing the pros and cons of getting a turf. As we have established, there are in fact many ways that artificial grass can improve your backyard which only reinforces how important it is to spread the word! 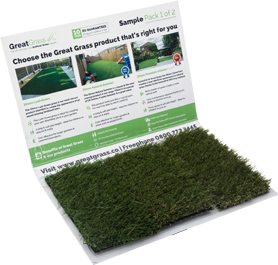 To find out more information, get in contact with a member of the Great Grass team today!